Some good beach weather around today, but Mother Nature must've got a wind machine for Christmas, she's keen to start it up and give it a go. 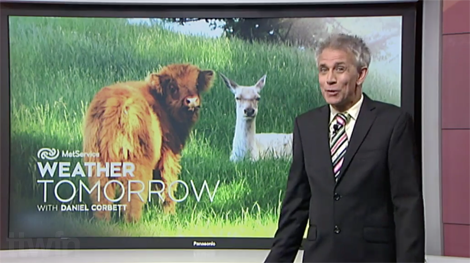 Christmas Day could see the 'odd spot of rain' but we're in for a cracker! Believe it or not, these two have seen the forecast and they're looking pretty happy [laughs] if you could say that. For most of us it's more likely the beach, the picnic baskets, instead of being stuck inside. Potentially this could sit there and you say, 'Urgh! I don't like that!' That's Christmas Day.. It's the question on everyone's lips: How's the weather looking for Christmas? Mother Nature, you can imagine her, just sitting there on the fence like this, not really making up her mind. Fingers crossed we can drag Mother Nature off the fence [gestures doing so] and get her to give us some decent-looking weather for Christmas Day. That's the weather, for now [point and nod]. 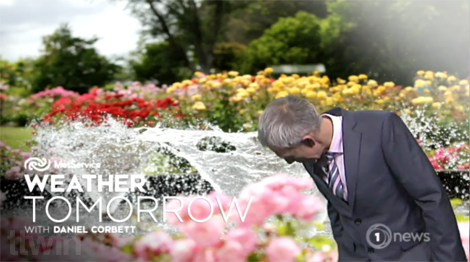 Mother Nature is still sitting on the fence, so to speak, about what weather to expect over Christmas says 1 NEWS weatherman Dan Corbett. 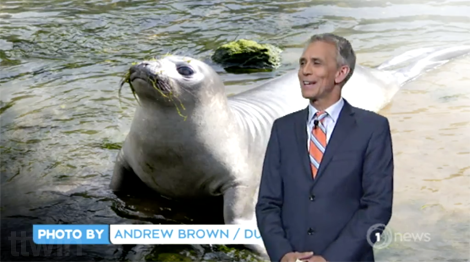 "The trick to getting Mother Nature off the fence and down to the beach with some fine weather will be for a high to be close to New Zealand on the big day." 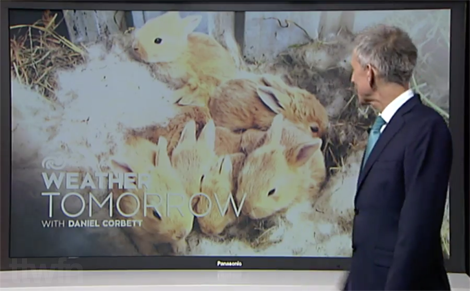 A better-looking forecast for Friday, even the little bunnies, they'll be happy as well. As always with early summer it does take a bit of time to hit its stride and always the leftovers of Spring sitting there, a bit like some gum stuck on the bottom of your shoe [inspects shoes].